SNOWSHOE mak-ing is an art, and while few, if any, white men can equal the Indian in weaving the intricate patterns which they prefer to employ for filling the frames, it is not very difficult to fashion a good solid frame and then fill it by making use of a simple and open system of meshing. For the frames, white ash is much the best wood, but hickory and white birch are dependable substitutes, if the former cannot be obtained. Birch is perhaps the best wood to use when the sportsman wishes to cut and split up his own wood, but as suitable material for the frames may be readily purchased for a small sum, probably the majority of the readers will elect to buy the material. Any lumber dealer will be able to supply white ash, and it is a simple matter to saw out the frames from the board. The sawed-out frame is inferior to the hand-split bow, but if good, selected material can be obtained, there will be little, if any, difference for ordinary use. Locate the Cross Bars frames have by Balancing the Frame, been finished Then Fit the Ends in been finshed, shallow Mortises the dry wood must be steamed before it can be safely bent to the required shape, and before doing this, a wooden bending form must be made. An easy way to make this form is to first draw a pattern of the model on a sheet of paper, cut out the pencil mark, and, placing this pattern on a board, carefully trace the design on the wooden form. A number of cleats, or blocks, of wood will now be needed ; the inside blocks being nailed in position, but the outside stay blocks being simply provided with nails in the holes, so they may be quickly fastened in position when the steamed frame is ready for the form. 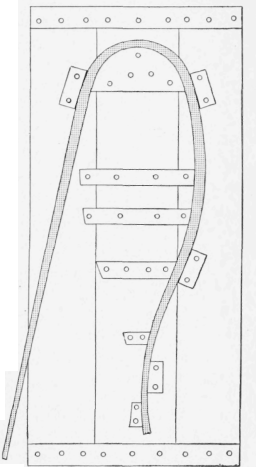 To make the frame soft for bending to shape, steaming must be resorted to, and perhaps the easiest way of doing this is to provide boiling water in a wash boiler, place the wood over the top, and soak well by mopping with the boiling water, shifting the stick about until the fibers have become soft and pliable. After 10 or 15 minutes of the hot-water treatment, wrap the stick with cloth and bend it back and forth to render it more and more, pliable, then use the hot-water treatment, and repeat the process until the wood is sufficiently soft to bend easily without splintering. The toe being the greatest curve, must be well softened before putting on the form, otherwise the fibers are likely to splinter off at this point. When the frame is well softened, place it on the bending form while hot. slowly bend it against the wooden inside blocks, and nail on the outside blocks to hold it to the proper curve. Begin with the toe, and after fastening the outside blocks to hold this end, finish one side, then bend the other half to shape. 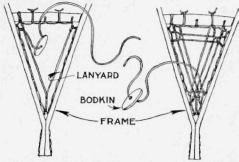 The bent frame should be allowed to dry on the form for at least a week; if removed before the wood has become thoroughly dry and has taken a permanent set, the frame will not retain its shape. The same bending form may be used for both frames, but if one is in a hurry to finish the shoes, two forms should be made, and considerable pains must be taken to make them exactly alike in every way. When the frames are dry, secure the tail end of the frame by boring three holes about 4 in. from the end, and fasten with rawhide. The work of fitting the two cross bars may now be undertaken, and the balance of the snowshoe depends upon fitting these bars in their proper places. Before cutting the mortise, spring the two bars in the frame about 15 in. apart, and balance the shoe in the center by holding it in the hands. When the frame exactly balances, move the bars sufficiently to make the heel about 3 oz. heavier than the toe, and mark the place where the mortises are to be cut. The cross bars and mortise must be a good tight fit, and a small, sharp chisel will enable the builder to make a neat job. It is not necessary to cut the mortise very deep; 1/4 in. is ample to afford a firm and snug mortised joint. The lanyard to which the filling is woven is next put in, by boring pairs of small holes in the toe and heel sections, and lacing a narrow rawhide thong through the obliquely drilled holes. Three holes are then bored in the cross bar - one on each side about 1 1/2 in. 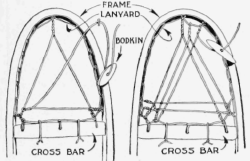 from the frame, and the third in the center of the bar; the lanyard being carried through these holes in the cross bar. Begin the toe filling first, by making an eye in one end of the thong, put the end through the lanyard loop and then through the eye, thus making a slipknot. Start to weave at the corner where the bar and frame are mortised, carry the strand up and twist it around the lanyards in the middle of the toe, then carry it down and make a like twist around the lanyard loop in the opposite corner. The thong is now looped around the next lanyard (No. 2 from the crossbar lanyard) and fastened with the twisted loop knot illustrated. Continue the strand across the width of toe space and make a similar loop knot on No. 2 lanyard on the starting side, twist it around the strand first made and loop it under the next cross-bar lanyard loop, then carry it up and twist it around the lanyard loop in the toe of the frame, continuing in the same manner until the last lanyard of the toe is reached, when the space is finished by making the twisted loop knot until the space is entirely filled. It is a difficult, matter to describe by text, but the illustrations will point out the correct way, and show the manner of making an endless thong by eye-splicing, as well as illustrating the wooden bodkin or needle used in pulling the woven strands taut. This bodkin is easily made from a small piece of wood, about 1/4 in. thick, and about 2 in. long. To simplify matters, the heel may be filled in the same manner as the toe. For the center, which must be woven strong and tight, a heavier strand of hide must be used. Begin with the toe cord first, and to make this amply strong, carry the strand across the frame five or six times, finishing with a half-hitch knot, as shown, then carry it up and twist it around the cross bar to form the first toe-cord stay. As may be noted, the center section is filled by looping back and twisting the strands as when filling the toe. However, the filling is looped around the frame instead of a lanyard, and a clove hitch is used. A toe hole, 4 in. wide, must be provided for, and when enough of the filling has been woven in to make this opening, the thong is no longer looped around the cross bar, but woven through the toe cord. 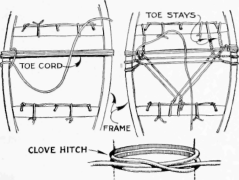 As the filling ends in the toe cord, it should be woven in and out at this point several times, finishing the toe hole by looping a strand around the cross bar at the side of the toe hole, then passing it down the toe-cord stay by twisting around it; then twisted around the toe cord along the filling to the other side of the toe hole, where it is twisted around the toe-cord stay on the opposite side, looped around the frame and ended in a clove hitch. At the first reading, it will doubtless appear difficult, but a careful examination of the illustrations will soon show how the trick is done, and indeed it is really a very simple matter, being one of those things which are easier to do than it is to tell how to do them. The method of filling has been purposely made simple, but the majority of shoes are filled in practically the same manner, which answers quite as well as the more intricate Indian design. The knack of using the snowshoe is quickly mastered, providing the shoes are properly attached, to allow the toe ample freedom to work down through the toe hole as each foot is lifted. The shoe is, of course, not actually lifted in the air, but rather slid along the surface, half the width of one shoe covering the other when it is lifted in the act of walking. 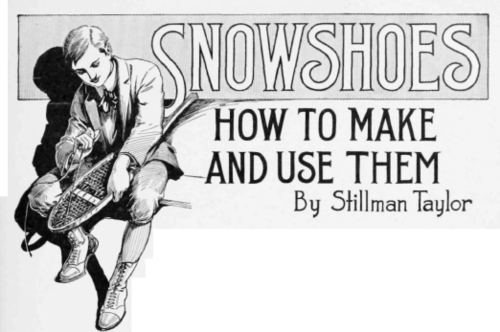 At first the novice may be inclined to think snowshoes a bit cumbersome and unwieldy, and doubt his ability to penetrate the brush. However, as the snowshoer becomes accustomed to their use, he will experience little if any difficulty in traveling where he wills. When making a trail in a more or less open country, it is a good plan to blaze it thoroughly, thus enabling one to return over the same trail, in case a fall of snow should occur in the meantime, or drifting snow fill up and obliterate the trail first made. When the trail is first broken by traveling over it once by snowshoe, the snow is packed well and forms a solid foundation, and even should a heavy fall of snow cover it, the blaze marks on tree and bush will point out the trail, which will afford faster and easier traveling than breaking a new trail each time one journeys in the same direction. A well-made pair of snowshoes will stand a couple of seasons' hard use, or last for a year or two longer for general wear. To keep them in good shape, they should be dried out after use, although it is never advisable to place them close to a hot fire, or the hide filling will be injured. Jumping puts severe strain on the frame of the shoe, and while damage may not occur when so used in deep, soft snow, it is well to avoid the possibility of breakage. Accidents will now and then happen, to be sure, and as a thong may snap at some unexpected moment, keep a strand or two of rawhide on hand, to meet this emergency.